Manjusri, the bodhisattva of wisdom, stands confidently with his peacock companion, who looks up adoringly at his master. Manjusri is portrayed as a handsome young god; his right hands exhibit the gesture of charity and hold a rosary and three jewels, while his left hands hold a manuscript, a flowering lotus and a fruit. The elaborate tiara with floral crests, the multiple necklaces and the long garland reaching nearly to his feet are all typical of Kashmiri sculptures. 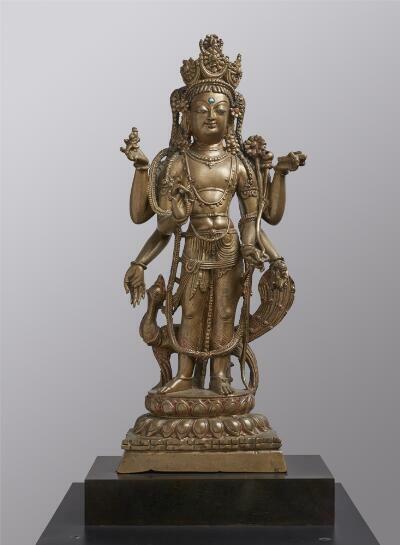 Here, Manjushri is a robust smiling youth with princely ornaments and an elegant, commanding presence. His many looping necklaces and garlands move the eye around this magnificent sculpture and are echoed by the arcs in his extravagant crown. Behind Manjushri, a peacock with luxurious wings and tail feathers gazes up adoringly—the bird, a symbol of immortality, is usually associated with him. Manjushri’s inlaid silver eyes and the turquoise urna in the center of his forehead add to the sumptuous effect of this unusual bronze. The urna represents a tuft of hair symbolizing auspiciousness. Each of Manjushri’s six hands holds an object or displays a gesture indicating one of his special characteristics or powers. One of his top pair of hands grasps a rectangular manuscript symbolizing his transcendent knowledge. The other holds an object representing the Three Jewels of Buddhism—the Buddha, the Buddhist doctrine, or dharma, and the Buddhist monastic order. His middle two hands hold a long, graceful lotus and a rosary. One of his bottom hands holds a fruit, most likely a lemon; the other performs the gesture of gift-giving.